One of Irish music’s most loved albums has long been Catherine McEvoy’s Traditional Flute Music in the Sligo-Roscommon Style which the Birmingham-born (England, not Alabama) flute player recorded with the US pianist Felix Dolan for Cló Iar-Chonnachta back in 1996. That album cemented Catherine’s reputation as one of Ireland’s foremost musicians, but her recording output remains sparse. Indeed, apart from the two Macalla albums, her only appearances have been on compilations such as Lámh ar Lámh (with her husband Tom McGorman). The Kilmore Fancy is again a family affair, but this time it is Catherine’s brother John who joins her on fiddle with the trusty Dolan returning for pianoforte duties. According to the detailed liner notes this album was actually recorded in Dublin back in August 2001. If this is not a misprint, one wonders why such an excellent album has taken so long to release! The album takes its title from a hornpipe penned by John for it is from near Kilmore in North Roscommon that the McEvoy family originates. John, in fact, is quite a composer as both his jig, The Spotted Dog, and the closing tracks, his No. 1 and No. 2 reels, amply demonstrate. If the latter seem familiar, it is because they appear (also as the closing track) as Rileanna John McEvoy on Macalla 2. 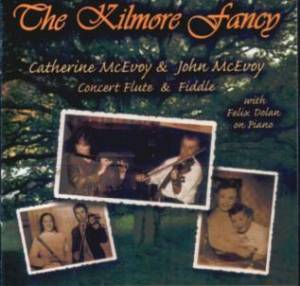 Like that other recent high quality album of duets, The Thing Itself, The Kilmore Fancy has a remarkably relaxed feel and is equally restful on the ears. Though it has the Connacht spring in its step it offers the sensation of two skilled musicians enjoying their music without a care in the world. In some ways too it draws parallels with that other superb album, Music of Sligo by Peter Horan and Fred Finn (when will CCÉ reissue that as a CD?). There’s a gentle touch to The Kilmore Fancy too, reinforced by the subtleties of Felix’s piano accompaniment and apparent from the very opening bars of the first track (Dan Breen’s/The Flowers of the Mill/The Pretty Girls of Mayo), three reels which date back to the musicians’ days in The Birmingham Céilí Band. Then follows one of the bounciest tunes imaginable, the jig Darby the Driver which segues into the aforementioned The Spotted Dog (which takes its name from a Birmingham pub). It’s that easy mix of the subtle and the bouncy which firmly characterizes The Kilmore Fancy and the McEvoys have tapped some of the most illustrious sources for their tunes too. Henchey’s Delight comes from a Seán McGuire recording from the 1950s, The Maid I Ne’er Forgot derives from Michael Gorman, while an untitled reel was learnt by John from the playing of John Kelly Snr. whose son John and Paddy ‘Offaly’ O’Brien provided Humours of Kilkelly. Then there are tunes from Paddy Fahy, Ed Reavy, Martin Mulvihill, Willie Clancy and Seáns Ryan and Keane. Such detail, of course, is drawn from the comprehensive liner booklet which not only provides these sources but information such as the fact that the version of Mama’s Pet, which Michael Coleman recorded, is not the Sligo favourite, but a variation associated with the Ballinakill area of East Galway. Finally, one really must remark on the wonderful tone of both musicians’ instruments. John’s stylish fiddling is exemplified by his solo rendition of The Maid I Ne’er Forgot/The Jug of Punch which also includes one of this reviewer’s favourite changes. Catherine’s solo is The Highest Hill in Sligo/Mama’s Pet and has a notably woody resonance reminiscent of Séamus Tansey at his very best. The Kilmore Fancy is hugely enjoyable throughout and one which will merit repeated playing for years to come.